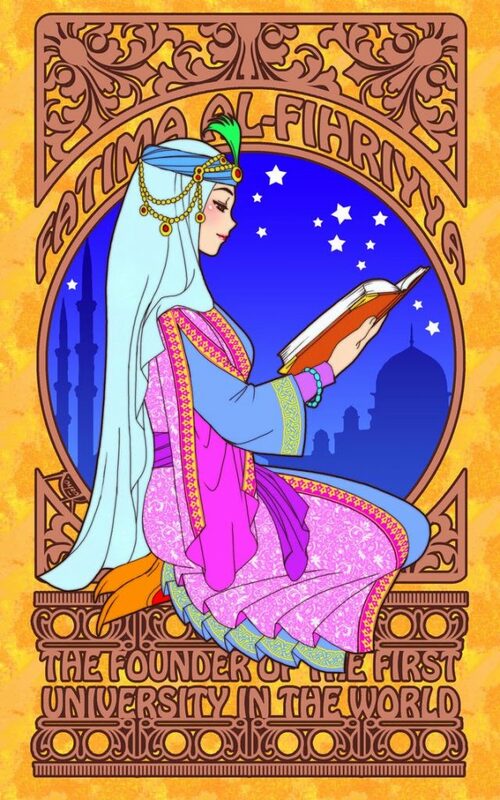 I was updating my Pinterest boards, having been inspired at my first Pinterest Party yesterday, when I came across this image of Fatima Al-Fihriyya painted by the artist Nayzak. Fatima Muhammad Al-Fihri (فاطمة محمد الفهري) in 859 founded a mosque and madrasa in Fes, Morocco. The madrasa, or school, came to be one of the most notable institutions of this kind; it is still in operation today, since 1963 as the University of Qarawiyyin, and is sometimes dubbed the “world’s oldest university”. What I noticed most was the amount of color she had on. Such dazzling, brilliant colors. I feel so honored to come from the Arabic culture that gave the world brilliant women that not only start universities, but also adorn themselves in style.